About The Author: During college, Patrick dived head first into the tech industry as a Product Management Intern for the American Red Cross's app development department. As a recent grad, he now works as a Digital Marketer at Fueled located in New York City. Fueled is an award winning app development and design agency, and their articles are primarily about mobile technology, mobile development, UX/UI and the social implications of those developments. Patrick loves working in the technology industry because he has a passion for all things tech, and it really shows in his writing. For over a decade, people have been turning to their smartphones instead of their watches to check the time. But look no longer, because the development of smartwatches save time and allow people to - I know this may be shocking - leave their phones in their pockets for once. "It has made me more present," writes Wall Street Journal reviewer Geoffrey Fowler. Fueled, a London app developer shares its favorite smart watches with you. Apple definitely has a leg up when it comes to crafting new mobile devices - thanks to the success of products like the iPhone, the company's longstanding commitment to quality design, and the resources of one of the world's largest and most successful corporations. Thus, the most hyped smartwatch of 2015 was the Apple watch, and most reviewers give it the nod for first place. The watch is an effective and efficient way for iPhone fans to do things like read emails, dictate text messages, and purchases through Apple Play. However, the price makes it unlikely that any but the highest earners will buy it - at least for now. The Pebble Smartwatch is one of the cheapest models on the market. The watch gets great marks from reviewers on its visibility in sunlight, which is a poor spot on many smartwatch reviews. 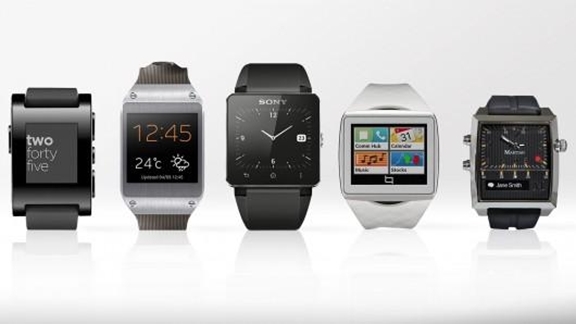 The watch has a significant community built around it, as it's one of the first smartwatches to have hit the market. However, it's a decidedly simple model compared with some of the pricier options on the market. That being said, there are over 1,000 apps already available on its App Store. And, it works with the iPhone and Android devices. The Android Smartwatch scene is bustling with activity, with a number of different developers looking to enter the market using Google's operating system. LG has produced some of the finest models, including the Urbane and the G Watch R. The G Watch R has an actual clock face, a rarity among the new models. In addition, it's got 512MB of RAM and 4GB of internal storage - impressive features for a wearable. The watch excels in the health and fitness sector, as it comes with a heart rate monitor and a 9-axis, including a gyroscope, accelerometer and a compass. Reviewers also note the extraordinarily clear display, which outshines many of its Android competitors. An important point to keep in mind is that almost every product review available ends with "it's far from a polished device." These watches are new to the market, many without an extensive community of Apps or the years of improvements that have shaped current smartphone technology. With that in mind, early adopters should expect significant improvements in the coming years.